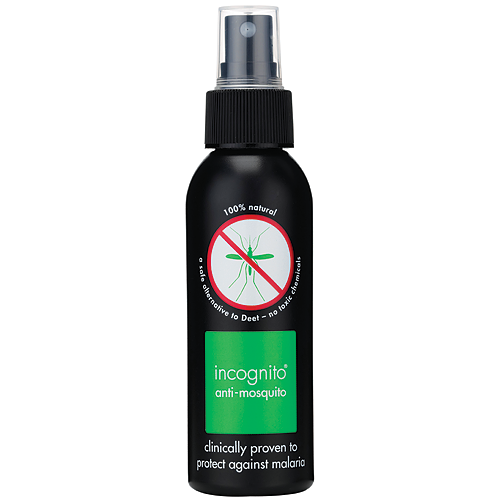 incognito mosquito repellent is now one of the strongest repellents in the world and provides excellent protection against all mosquitoes and most biting insects. Put bluntly, if you use it you are highly unlikely to ever get bitten! This new formulation does not contain citronella. The new active ingredient in newly formulated incognito spray, eucalyptus maculata citriodora, has been rigorously tested under extreme conditions by one of the worlds leading universities on African mosquitoes and is found to be as effective in the short-term as the worlds most deadly insecticide! It is stronger than any Deet based product yet incognito is certified as 100% natural and can be used by all the family including young babies. Because of further research, funded by the Gates Malarial Partnership and published in the British Medical Journal, the active ingredient in incognito is clinically proven to protect against malaria when used in conjunction with an impregnated mosquito net. Just as humans are attracted to each other’s pheromones, insects are attracted to their hosts by kairomones – the one mosquitoes are particularly partial to is carbon dioxide. Others include lactic and carboxylic acids. Kairomones are eliminated by the body in proportion to the rate of metabolism. Therefore the more active, the more attractive a meal you are! Most kairomones can be detected by a female mosquito up to one kilometre away! To be applied after applying your own sun protection and lasts up to 5 hours, however more liberal application may be needed in a more tropical climate where mosquitoes may be more present. A 100ml bottle will last for approx one week. There have been no tests carried out on any `repellents` or `protectors` for pregnant women, research has never been done nor is it ever likely to because it is unethical. What we can say is that all of the ingredients in incognito are 100% natural and that many women have used incognito while pregnant with no known adverse reactions or side effects. It has also been used very successfully on babies as young as 4 weeks old. We do suggest that you get the basics: a soap (or shower gel i.e. our hair & body wash). Exfoliate with our luxury loofah soap - this is very important to lessen the attractiveness to insects. The moisturiser is quite gentle and offers a good level of protection too. Because of pregnancy nearly all women become mosquito magnets so it is essential to take as many precautions as possible. We do strongly recommend that you do a patch test on the inside of your wrist before you go on holidays to see if any rash appears. No reaction usually means that the product is totally safe for the wearer to use. There have been no reports of any problems when using incognito during pregnancy or at any other times for that matter but as every individual is different, we always recommend the patch test just to be sure especially as during pregnancy sensitivities can increase. 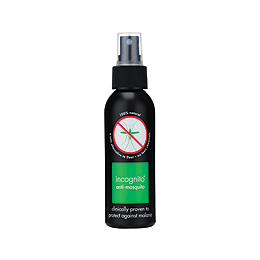 Below are reviews of incognito Mosquito Repellent - 100ml by bodykind customers. If you have tried this product we'd love to hear what you think so please leave a review. Really pleased with this product. Worked well for me during the summer. Have now purchased other products in the range to give me full cover for next year. Quite a strong smell but much better than aerosols I have used in the past and cruelty free. Have not been bitten since I have been using it although I have not tried it abroad. This is the only insect/mosquito repellent I will use. I have never been bitten when I've used it and neither have my children, so I won't use anything else now. Used in places like Italy (Lakes), UK, Egypt, Croatia, Majorca, France etc. Brilliant. Minimal bites (2-3!) in a while 2 weeks of travel to India in December.